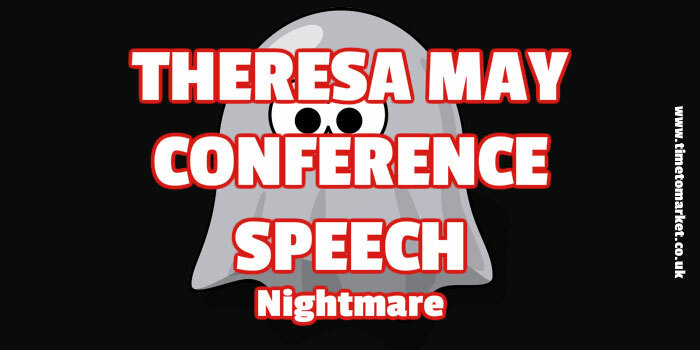 What was the point of this Theresa May conference speech? Was it a conference leadership speech, a rallying speech or a mea culpa speech. Theresa May and her team probably intended her speech to be all three. So, a speech that set out a bold vision for Britain, a speech to rally the party for the efforts ahead and also, an apology for the near disastrous election in the Summer. She introduced her conference speech with a classic look back in history. This was her history, over 40 years ago. But would this personal material actually work? Because the sense was that this might not be right for this Theresa May conference speech. However, the very personal beginning allowed the Conservative leader to handle her apology up-front and early in her conference speech. Once she had done this, she swiftly moved to other matters. The British dream. Whenever we heard her audience applaud, we also heard Theresa May coughing. Very tidy little coughs, but coughs. We noted at the time that this might be the result of the earlier cold that she had admitted to having. However, it was to get a whole lot worse. That's because Theresa May, an interventionist in the energy and housing markets, suffered her own intervention. A prankster, Lee Nelson, managed to get on to the stage and hand the Prime Minister a P45 form. Bizarre stuff, indeed. This intervention upset the balance of the Theresa May speech, but also began another coughing bout. This time there was no controlling it. Since cough sweets and water didn't work. A real nightmare in Manchester for Theresa May. Still, it was obvious that the conference audience got right behind her. So, they applauded vigorously...seemingly giving her the time to rejuvenate her voice. We can't deny that the Theresa May conference speech was hard to listen to. Not least because her delivery was suffering. but she showed fragility, albeit not intentional, and doubtless her audience was supportive. You can't choose to have a cold during conference. But you can dose up and get sorted beforehand. But we don't know whether she had done so. Perhaps not. Certainly Alastair Campbell thought she could have done better! She used repetition well in key sections of her conference speech. And she also tried her hand at some position takers and other rhetorical devices. Yet, somehow, with a fragile voice, she couldn't carry it off. And that was a pity, because the full script for this Theresa May conference speech does read well. It's not a problem. We also noticed that the background lettering also began to give up the ghost with this nightmarish occasion. First we lost an F, and then near the very end we lost an E. The net result? Ah, yes, the vagaries of staging. It's not unusual. President Obama once one lost his Presidential Seal during a speech. Fortunately Theresa May couldn't spot the silent disappearance of key figures from her conference platform. But would more humanoid characters also now abandon her? 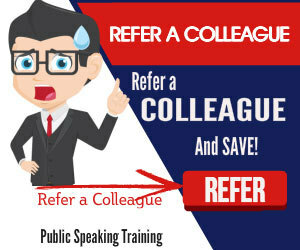 When you need more attention on your conference speaking you can always join us for either public speaking coaching or training. We can train you at your own offices. Or, you can choose one of more than 40 training centres in the UK. Please don't hesitate to get in touch when the time is right. 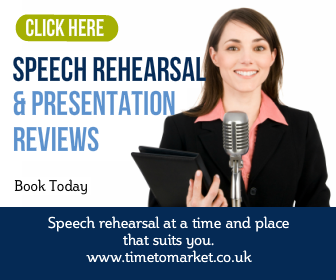 Previous Post How To Deal With Hecklers During A Speech Next Post How Long Should Your Speech Be?